This business offers comfortable and safer transport services for differently-abled people. 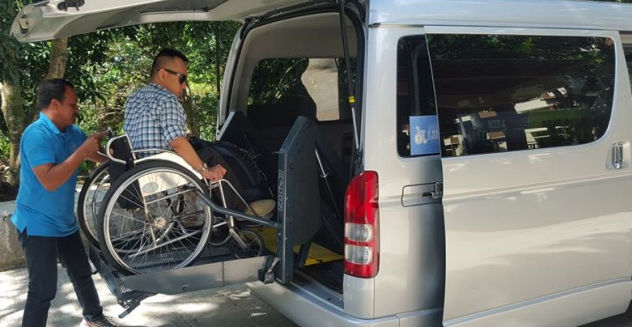 The grandmother of Neil Gosingtian, LifeLifters Transport's managing director, has been in a wheelchair and had difficulty moving in and out of a sedan. He studied his grandmother, as well as other people with physical disabilities, and concluded that with the help of a van with a wheelchair lifter, their freedom of movement need not be hampered while quality of life and personal wellness are better assured. Q1: You provide a relatively new Hi-Ace van with a lifter capability for wheelchair passengers. How did this pioneering van rental concept come about? A: The idea for the van started when my uncle Josiah Go accompanied my grandmother, who is confined to a wheelchair, to Macau. Since it was painful and inconvenient for her to be lifted from her wheelchair and carried into a sedan car, he rented a van there that was equipped with a wheelchair lift. She enjoyed her trip, since she was able to freely travel. 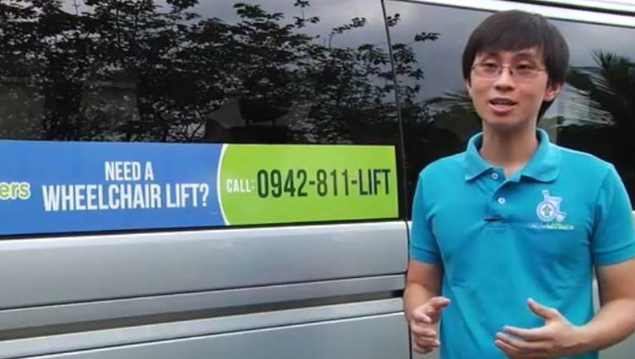 We saw the potential of the idea in the Philippines and decided to make the service available locally. Q2: What were the challenges in starting this niche business? A: Building awareness is a challenge. Most families in the Philippines are still accustomed to carrying their loved ones into their vehicles, and they are unaware that there is a painless and convenient alternative. Another challenge is the demand for travel for this niche market. Apart from occasional trips to the hospital and family events, elderly wheelchair-bound passengers would prefer to stay at home. Q3: What have you discovered about the needs of wheelchair bound passengers? A: As with passengers of any vehicle for rent, our clients expect the driver to be punctual and courteous. They also expect the vehicle to be clean and orderly. But with wheelchair bound passengers, there is the added dimension of care. Family members are particular with how our driver pushes the wheelchair of their loved one. They also request our driver to drive slowly, even though we securely fasten the wheelchair with restraints. We have also observed that for local wheelchair bound passengers, it is the family members who reserve the van on their behalf. Foreign wheelchair bound passengers, on the other hand, tend to contact us directly, since they are accustomed to this type of service in their own countries. Q4: Has there been an emotional moment where you felt that you were beyond lifter van rental? A: When the business was starting, we were expecting that all our clients would be confined in wheelchairs. But surprisingly, one of our clients was a child in a stroller. Her parents rented our van, because there was an oxygen tube attached to her, and they wanted to avoid unnecessary movement while loading her and her medical equipment into the car. I wondered to myself what their alternative would be had our service not been available. Q5: What are your rental prices and how did you determine these prices? A: For trips within Metro Manila, our halfday rate (maximum of 4 hours of continuous use) is P5,500.00, while our wholeday rate (maximum 8 hours) is P7,500.00. We also offer a one-way short trip (pickup and dropoff only) promo price of P3,500. Q6: Are there any option other than rental? A: Yes. For families who have their own vans, we also offer supply and installation of the electric wheelchair lift. For those who are looking for a more economical option, we recently offered installation of a manually deployable wheelchair ramp. For both options, restraints are included to prevent the wheelchair from moving while the van is travelling. Q7: What are your future plans for LifeLifters? A: Aside from expanding our fleet of vans, we want to continue building awareness about people with disabilities. In collaboration with Thinkbit, we’ve started posting articles on our blog (http://lifelifters.net/posts/) about disabilities. A recent post discusses what amenities establishments can add in order to make them more accessible to people in wheelchairs. Since the beginning of our operations, part of our earnings are donated to God is Able International Foundation, a Christian NGO that distributes wheelchairs and conducts family retreats for people with disabilities. Beyond doing well, we want our business to do good.